It has been a strange last ten days since we unexpectedly entered grant writing mode. I was looking forward to work on this issue near the end of the year but a likely change on funding agency priorities requires applying in a few weeks; unfortunately, it means that all this is happening at the same time I am teaching. As usual I got involved in a strange, for me, project which will require semantic analysis of international treaties. I will start having a look at Latent Semantic Analysis using lsa in R and gensim in Python. I’ll have to retrieve documents from the web and process them in quite a few ways. The success of some of Hadley Wickham’s packages got me thinking about underlying design issues in R that make functions so hard to master for users. Don’t get me wrong, I still think that R is great, but why are there so many problems to understand part of the core functionality? A quick web search will highlight that there is, for example, an incredible amount of confusion on how to use the apply family of functions. The management of dates and strings is also a sore point. I perfectly understand the need for, and even the desirability of, having new packages that extend the functionality of R. However, this is another kettle of fish; we are talking about making sane design choices so there is no need to repackage basic functionality to make it usable. Talking about failures, Andrew Gelman mentions the sempiternal problem of designers Turn(ing) a Boring Bar Graph into a 3D Masterpiece or, as a commenter put it, “Turn(ing) a Boring Bar Graph into a 3D Pile of Steaming Crap”. While it is always easy to have a laugh on designers, we should remember that the abundance of 3D piles[…] also reflects our failure to make the point on good data presentation clear. Well, that and the spawn of evil Microsoft Excel and PowerPoint. 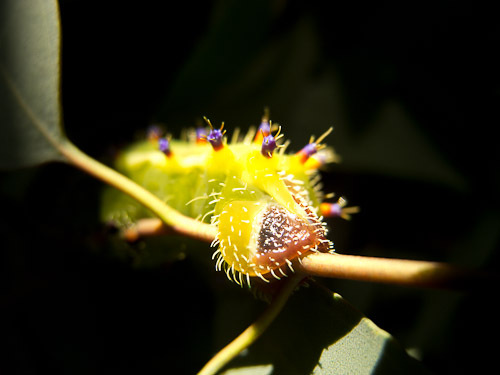 Gratuitous picture of a vegetarian friend: caterpillar of Emperor gum moth (Photo: Luis). Beware if you are going out for dinner with vegetarian friends. Besides vegetarians having an inordinate influence on the choice of restaurant you may end up subsidizing their meals. HT: @EricCrampton. A cool collection of movie snippets that display mathematics. HT: @Freakonometrics. http://numfocus.org a foundation for supporting scientific computing in Python. HT: @teoliphant. Andrew Gelman again, this time pointing out to Thaddeus Tarpey’s presentation All models are right… most are useless (PDF), focusing on the positive aspects of model approximation.